Can the Airbnb economy make it possible to afford a second home? 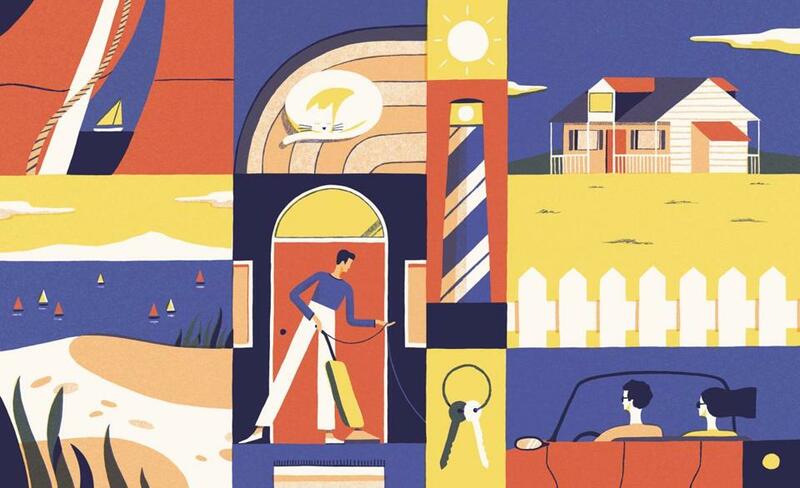 If you’ve ever rented a vacation house with your family or friends — scrambling to find a week that works, then forking over thousands of dollars for it — you’ve probably entertained a certain daydream: What if I were the one collecting all this money?If we owned a vacation home, we could pick any weeks we wanted and rent it out the rest of the summer. Heck, you think, maybe we’d even make money. When you’re back home, you chalk up the daydream to sun exposure. But was it really just the time off talking? The average vacation rental owner surveyed by HomeAway, the online rental marketplace, grossed $28,000 in income last year — and three-quarters of them earned enough to cover more than half of their mortgage. To be sure, the math looks enticing. The median home price on Cape Cod is now $340,000, according to the Warren Group, which means mortgage payments could run you about $1,300 a month (before taxes and insurance). Meanwhile, HomeAway says the average Cape summer rental fetches $1,720 a week. Hey, the daydreamer thinks, I can live with half. So if renting out a vacation home sounds like your kind of retirement plan, here’s what you should know before signing on the dotted line. How a clever redesign helped them stay in the neighborhood where their family has deep roots. The first thing to consider about a second home, of course, is whether you can really afford to buy one. We’re talking here about territory traditionally trod by the affluent: The median household income of vacation-home buyers was $103,700 in 2015, according to the National Association of Realtors, 27 percent higher than those purchasing a primary residence. However, vacation homes tend to be much smaller (and cheaper) than primary residences, says Jessica Lautz, the association’s managing director of survey research and communications. That’s partly because they’re more likely to be condos or town houses. “There’s less maintenance on those properties, so if you’re not there as often, that’s important,” Lautz says. Vacation-home buyers are also more likely to pay cash. “And when they do finance, they’re putting down quite a large down payment,” she says. On the Cape, Logie agrees that no one wants to spend their vacation dodging out-of-town drivers. “The only homes we don’t [represent for owners] are directly on a main road,” she says. But in the peak summer season, “as long as the house has air conditioning, Internet, the desired casual coastal decor, and it’s priced right, it will book,” Logie says. And what, exactly, is the right price? That will depend on a number of factors, including the home’s location, size, and condition. “Do some competitor research,” recommends Laurel Greatrix, associate director of communications at TripAdvisor Vacation Rentals. “Search for properties similar to your own, look at what they’re charging, and see how full their calendars are.” Logie and Hall do this legwork for their clients, providing them with a competitive rental market analysis. Airbnb users can take advantage of the home-sharing site’s Smart Pricing feature, which can recommend an appropriate price point for your listing and automatically adjust your rate according to supply and demand. That brings us to another decision: where to list your rental. In places like Cape Cod or the Berkshires, local property management services can handle all the booking, cleaning, emergency house calls, and maintenance issues for a set fee or a percentage of the rent. That’s a must if you live far away. “We have some homeowners who never come — we just take care of everything,” says Logie. The advertising and on-the-ground presence of these services can also lead to more bookings at higher rates. But that turnkey service comes at a fairly steep price : Commissions can eat up 17 percent or more of your rental income. But home-sharing and short-term rental sites such as Airbnb and HomeAway have changed the industry dramatically, allowing owners to take a more hands-on approach — and keep a larger share of the rent — if they choose. On Airbnb, it’s free to list your property (or even just a bed within it), and the site will charge you 3 percent of each booking, on top of a guest fee that ranges from 6 percent to 12 percent. HomeAway (which also operates VRBO, or Vacation Rentals by Owner) offers two price structures, depending on how often you rent, and now charges guests a service fee that averages about 6 percent. TripAdvisor Vacation Rentals, which operates FlipKey and other rental sites, charges owners a 3 percent commission, while guests pay a 5 percent to 15 percent fee. A word of advice if you take the DIY route: Don’t underestimate how much work you’ll face. College students and twentysomethings looking for a place to crash in Boston are one thing; vacation renters are another. “They’re looking for their dream vacation,” says Laslie. Good guest reviews are crucial on home-sharing sites, so the little things count. Your house should be hotel-ready, she says, deep-cleaned and decluttered down to the drawers and closets, with everything from appliances to screen doors in working order before guests arrive. There’s an art to guest relations as well. “Communicate frequently with your guest before their arrival, but leave them alone once they’re there,” Bernardini says. If they have questions or problems, though, respond right away. And make no mistake, there will be problems. Bernardini remembers one Thanksgiving when a freak storm knocked out the power just as renters arrived to cook a holiday feast. “They wound up calling me every 30 minutes or so for several hours on Thanksgiving Day,” Bernardini says. “I was trying to get an elaborate dinner on the table — and had already consumed a few glasses of wine — while having to explain things like pouring water into the toilet tank to get it to flush or how to make a fire in the wood stove.” In the end, she refunded their money and later installed a generator. Paperwork and local regulations can also complicate matters. Some condo or homeowner associations don’t allow short-term rentals at all, and even if they do, they could change the rules on you at any time. Likewise, some town zoning laws restrict short-term rentals, and legislators all over the country are grappling with how and whether to regulate the industry now that Airbnb and HomeAway have become such big players. Massachusetts lawmakers are considering a new bill that would extend state and local hotel taxes to short-term rentals, a step that both Airbnb and the hotel industry support and that would bring as much as $20 million in annual revenue to the state. The rental industry’s growing pains are sure to continue — and with them some looming uncertainty. Whoa, man, the vacation-home daydreamer may say at this point, you’re kind of a downer. Yes, if you were hoping to rake in vacation-rental income to fund your second home or retirement, these logistics and legalities may seem like forbidding storm clouds. And for good reason: Renting out a vacation home is unlikely to be the money-minting machine of your midsummer reveries. But while it requires some more realistic expectations, it doesn’t mean you have to give up on the idea. Jon Gorey is a frequent contributor to the Globe Magazine. Send comments to magazine@globe.com.